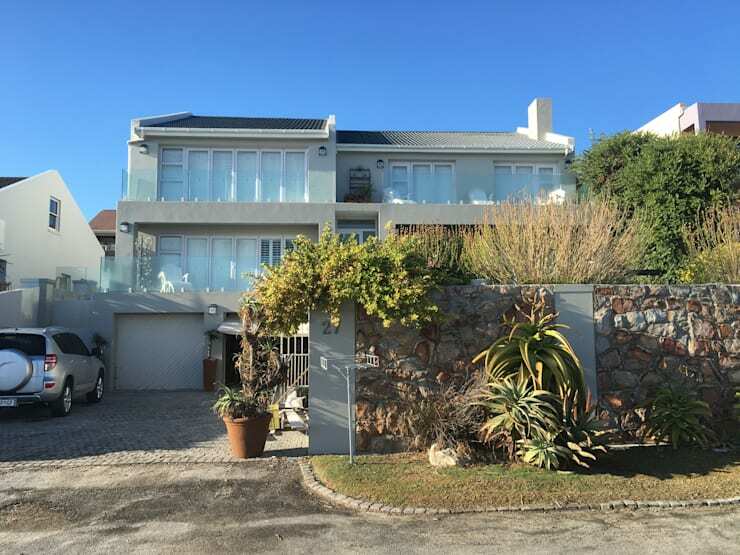 In this edition of homify 360, we head to stunning seaside town of Hermanus in the Western Cape of South Africa. 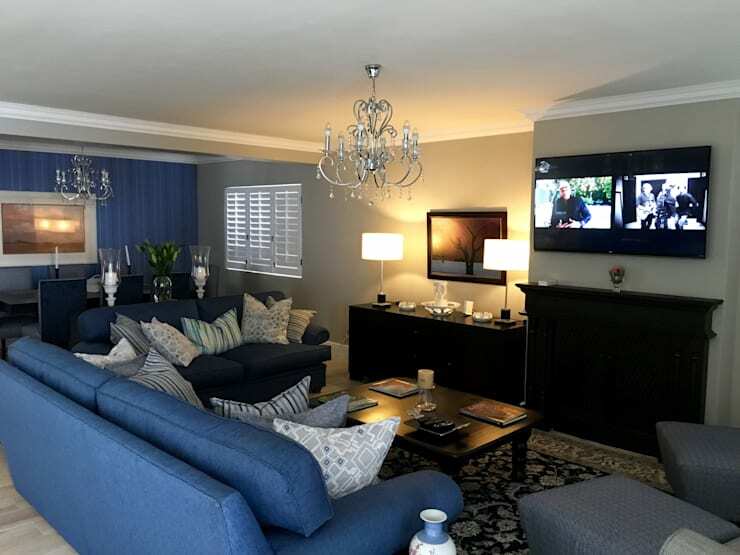 The town is almost two hours’ drive from the bustling city of Cape Town, and enjoys gorgeous ocean views, the glorious mountainside of the Overberg region and a quaint little town that is filled with an old fashioned charm and relaxing atmosphere. Hermanus would be the perfect place to settle down and enjoy the finer things in life, whether it be just views of the Indian Ocean, taking a stroll along its pristine beaches, or going digging for white mussels in the sand. And because it's spring, in a few weeks’ time Hermanus will be filled with tourist and Capetonians will flock to the seaside town for the annual Whale Festival, where Southern Right Whales visit the cove. This large home has a striking and eye catching exterior. The architects opted for a facade that is simple yet attractive, while the minimalist theme and neutral colour palette ensures that this stylish modern home will remain trendy and contemporary for years to come. The gorgeous greenery adds an excellent and nature loving touch to this sensational structure, but wait until you see the interior! This home has a strong personality and a fascinating theme colour incorporated throughout the interior. The spectacular sea blue is a great choice as it creates that elegant seaside charm to the home. The living room is decorated in comfortable sofas, luxurious lighting and tasteful accents, creating a space that is holistically chic. 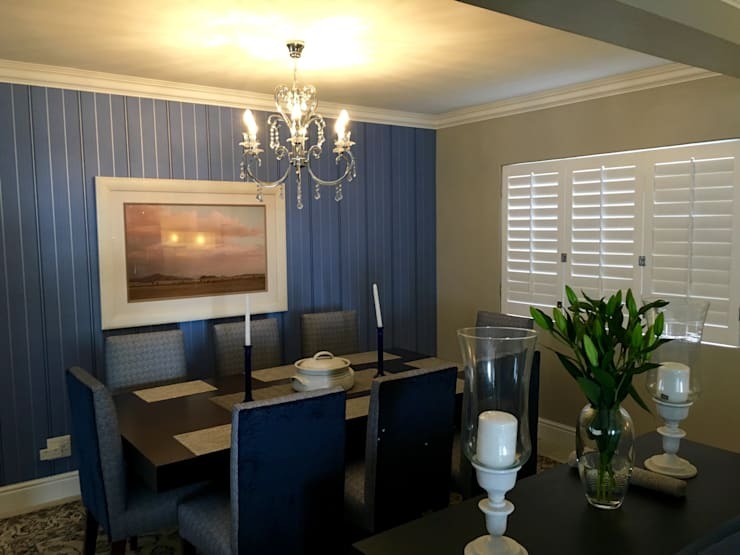 The sea blue colour scheme has been incorporated into the dining room as well, while a gorgeous chandelier creates an almost perfect romantic ambiance. The walls have been expertly decorated, with blue wallpaper paying homage to seaside location, while the grey wall and white ceiling creates an uncluttered and tidy space. The addition of fresh flowers to this indoor decor adds a subtle and comfortable attraction that is just marvellous. 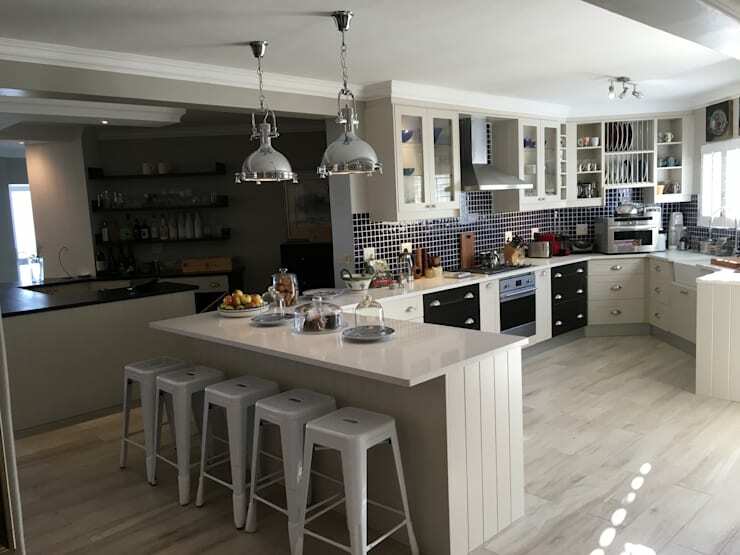 As we progress in our tour of these majestic home on the east coast of South Africa, we need to have a look at the kitchen too. This cooking area is divine! From the simple use of colour, all-white cabinets, ceiling and countertops, with a blue backsplash and blue accents included within the kitchen design as well. The modern kitchen has a rustic element in the design, with an informal dining area adding a cosy space too. It's lovely and spacious from all angles. 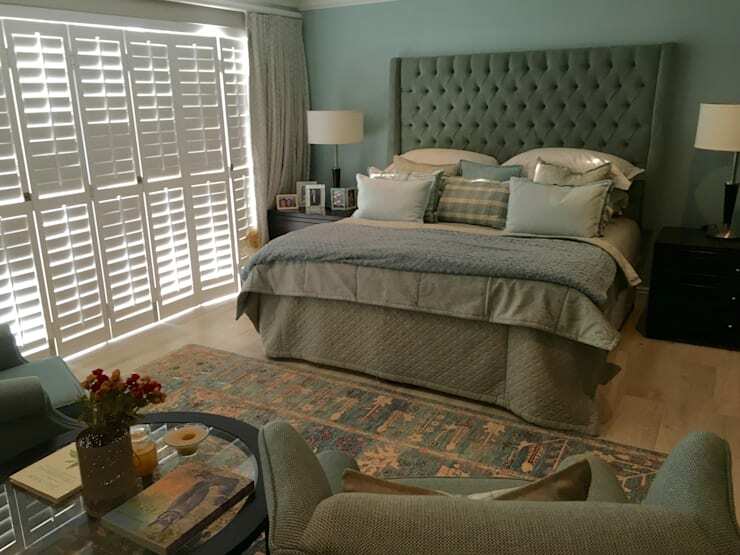 The grand bedroom is a sensational space within the home, but this room is decorated in a comfortable sea green, again creating that chic marine inspired theme, but with a whole new dimension of colour and style. This master bedroom is spacious, luxurious and full of light. The addition of white shutters instead of blinds ensures that the interior remains cool and comfortable, while also looking sophisticated and tidy from the exterior. Although the space in this bathroom is limited, the designers made the most of the area and created a lively and relaxing serenity zone. 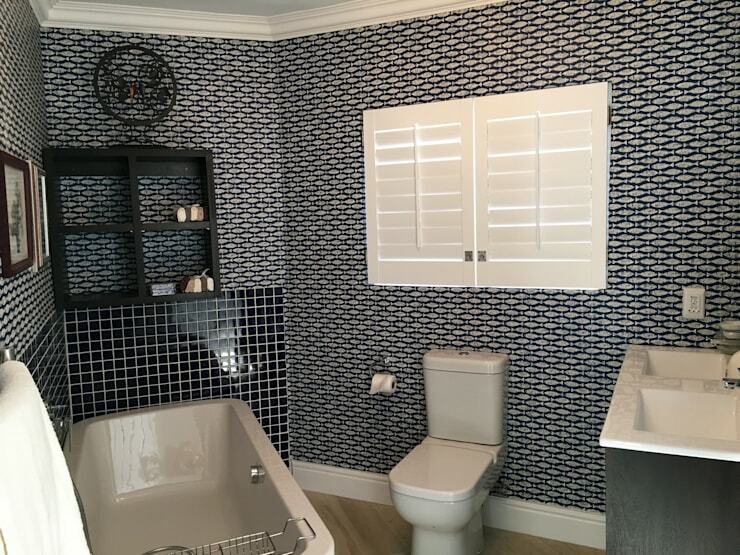 The navy blue mosaic tiles that lines the all-white porcelain bath tub and the adorable wallpaper in a similar patterns makes this bathroom a simple yet stylish part of the home. The bathroom fixtures are all-white, adding a sleek and attractive effect to the interior. If you liked this South African house, then have a look at The spectacular Stellenbosch farmhouse too! Would you like to live at the seaside?